What Day Of The Week Was July 9, 1999? 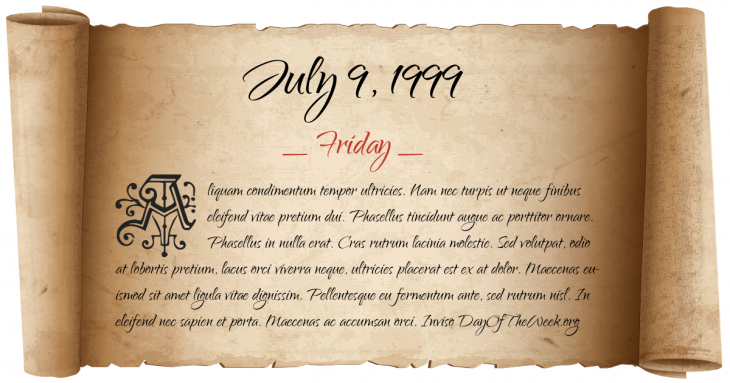 July 9, 1999 was the 190th day of the year 1999 in the Gregorian calendar. There were 175 days remaining until the end of the year. The day of the week was Friday. A person born on this day will be 19 years old today. If that same person saved a Half dollar every day starting at age 5, then by now that person has accumulated $2,699.50 today. Here’s the July 1999 calendar. You can also browse the full year monthly 1999 calendar. Rabbit is the mythical animal and Earth is the element for a person born on this day if we consider the very old art of Chinese astrology (or Chinese zodiac). Days of student protests begin after Iranian police and hardliners attack a student dormitory at the University of Tehran.